Instant articles are for publishers to create fast and interactive stories on Facebook. They are fast loading versions of web stories that have been optimized for mobile devices. 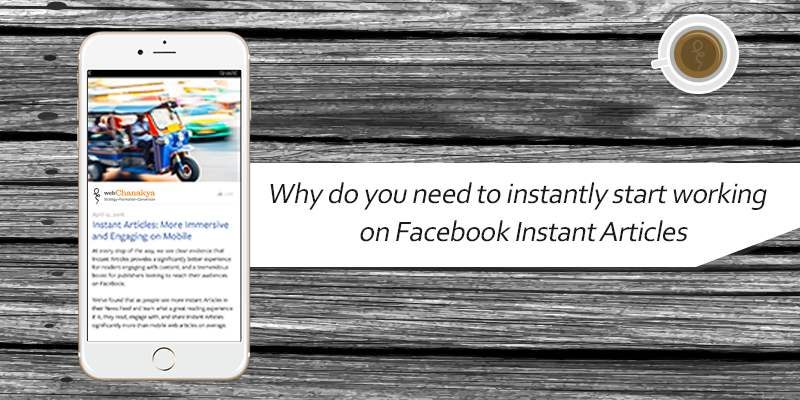 Recently, Facebook rolled out instant articles format to all publishers. Using which, they can show readers a fast-loading version of their posts while displaying their native ads. Previously this feature was only open to official publisher partners. Of late, Facebook has become one of the top referrers of traffic to news sites and blogs of all sizes. It was stated that Facebook had overtaken Google as the number 1 referrer of traffic to news sites. Instant Articles were built to solve a particular problem i.e. slow loading times on the mobile web Opening up Instant Articles allows publishers to post the articles that render and load quickly, to people all over the world. With Instant Articles, they can also take control on what they would post be it their native ads or their content. Facebook allows publishers to drive revenue from their content. If you want to sell ads along with the content, Facebook will provide you 100% of the revenue and takes 30% of the revenue if the ads are sold through Facebook’s Audience Network. Facebook’s Audience Network offers publishers to take advantage of Facebook ads, to monetize their content, and once you get started with Instant Articles you have an option to opt-in to Audience Network ads. Here’s an advantage, if you sell your own ads, you can stuff video ads, animated ads and banner ads within articles. es. Even when you build and publish an Instant Article, it doesn’t itself creates a post from your Facebook page. Instead, when a reader operating through mobile is directed to the URL of the articles on Facebook where the link is displayed as an Instant Article. Fast loading speed is important for any blog, and Instant Articles can load up to 10 times faster than mobile web articles speed. Facebook reports that Instant Articles have 70% lower bounce rates and 30% higher share rates than standard mobile web articles. Since Instant Articles are optimized and load within the app rather than on the standard mobile web, they render and load up to ten times faster, making it easier for readers to read and share. .
As soon as you get started with Instant Articles, you can take over the control of which articles you would like to share on Facebook. This implies that you can either republish any article from your blog, or just a select a few. Email is one of the fundamental part of any content marketing strategy. Facebook has addressed the fear of missing out on your potential subscribers by enabling email capture feature within the articles. Facebook stated that they have heard from many publishers that they want to build a direct relationship with their readers through Instant articles hence they have added the emailing feature. It is analysed that 30% of Facebook’s active users access the social network on their phones. Due to the full-screen experience of Instant Articles, publishers can have a control over what mobile users can access. We’re living in a world where people like to browse via mobile phone rather then taking a painstaking road to read the stuff they like on their computer screens or laptops. But it is likely that many websites still don’t provide a satisfying mobile experience. Facebook definitely promises advancement in better reading experience with Instant Articles, and proves that there are enthralling reasons to try out Instant articles as socially integrated, mobile-optimized content distribution feature. Instant Articles is still an evolving platform, means that it’s changing according to publisher’s feedback.